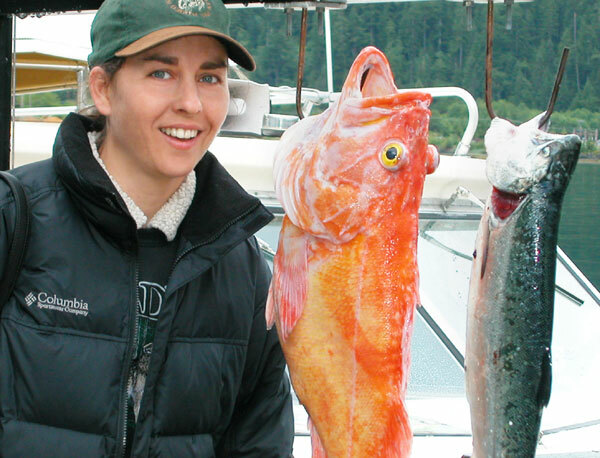 August 21, 2009 - Sommer Setterstrom with the biggest fish of her life. 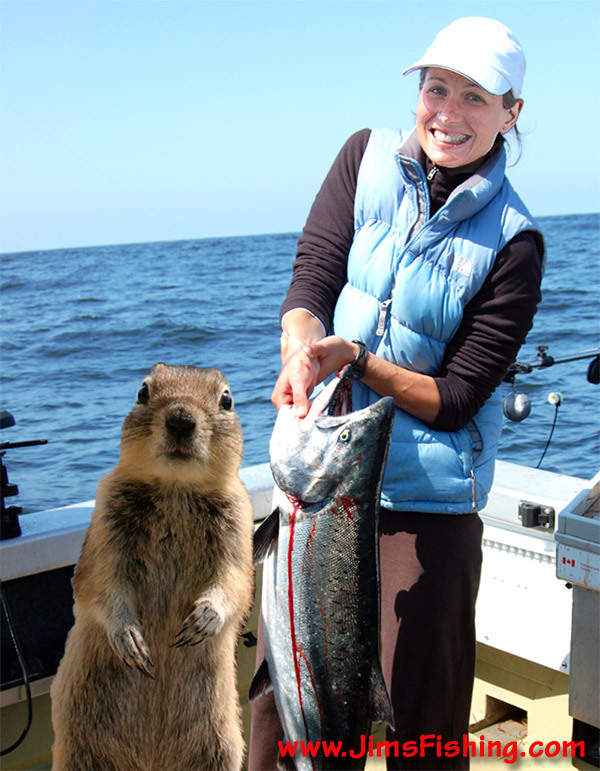 Guest appearance by the Crasher Squirrel. 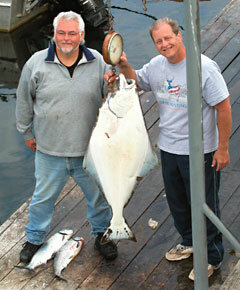 August 21, 2009 - Harley Cunningham with 82 pound Halibut. 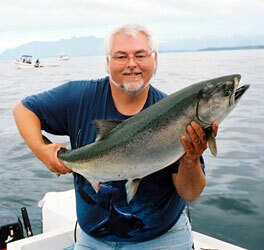 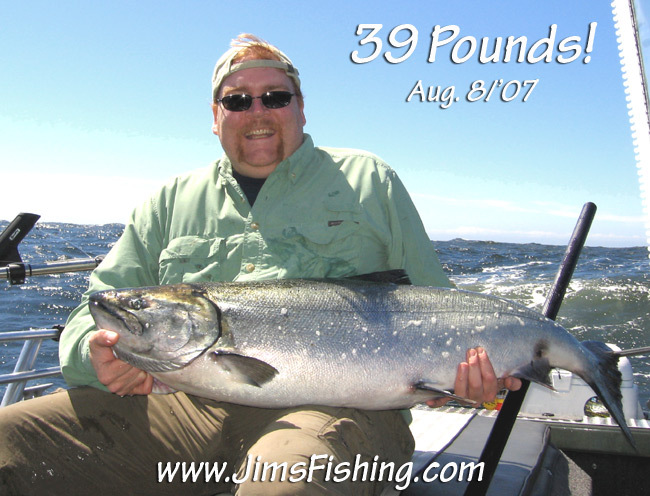 August 21, 2009 - Todd Cunningham with a 28 pound Chinook Salmon caught on a 6" Tomic 280 Plug. 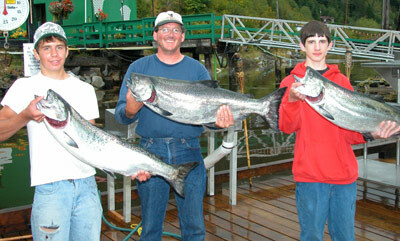 August 21, 2009 - A dozen Salmon - 6 Coho, and 6 Chinook, largest 32 pounds, on the cleaning table. 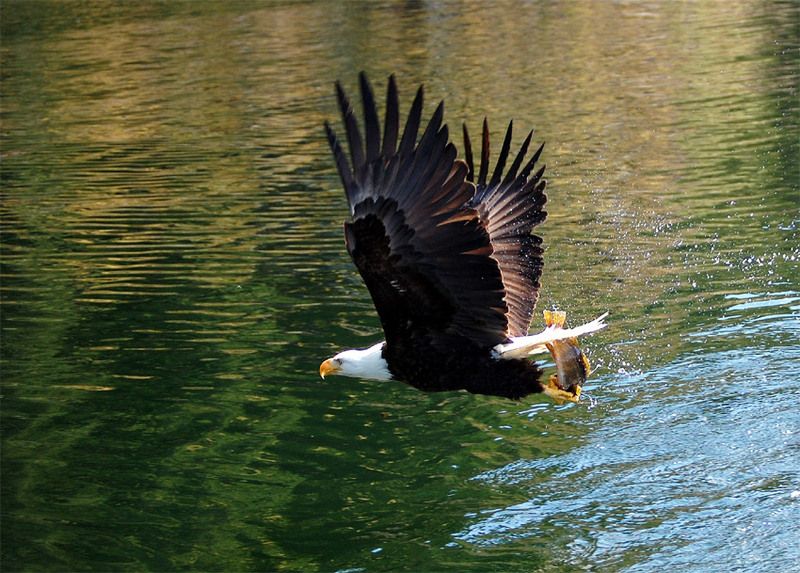 May 12, 2009 - Bald Eagle takes a small Rockfish from the surface in Tahsis Narrows. 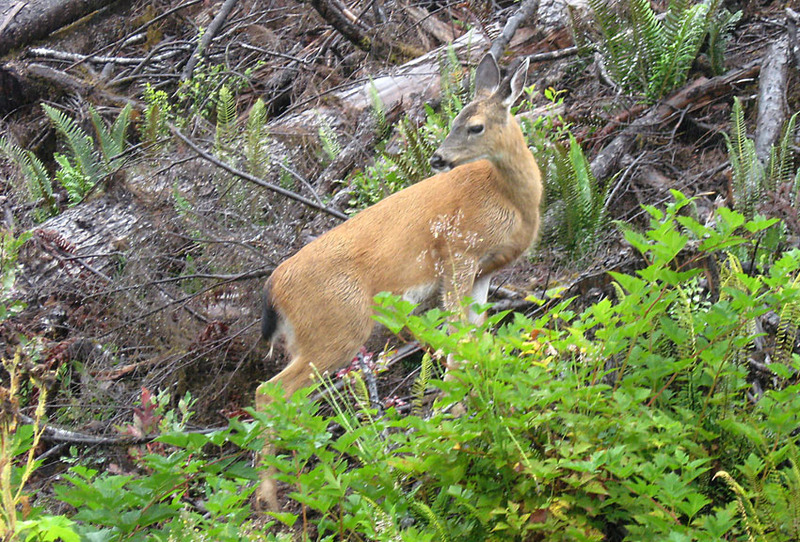 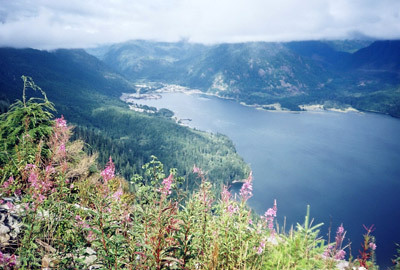 I sent this photo in to Weatherman Wayne Cox at Global BCTV and it was used on "Wayne's Weather Window" and won Photo of the Week. 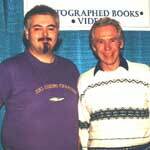 You can see the videos in the YouTube links above this photo. 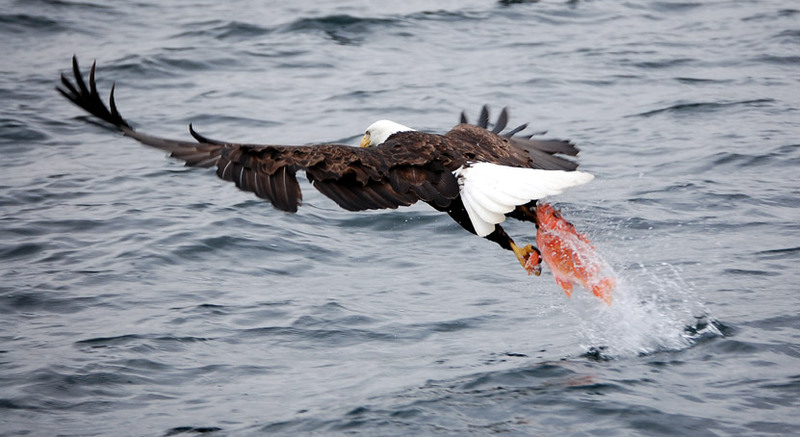 May 11, 2009 - Bald Eagle takes a small Canary Rockfish from the surface in Esperanza Inlet. 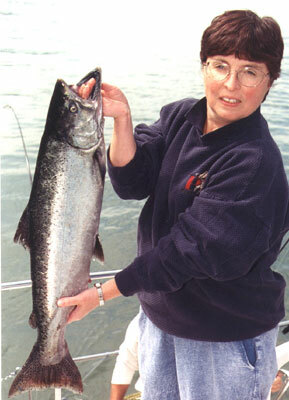 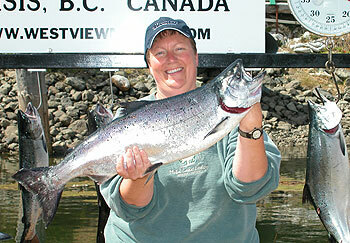 May 12, 2009 - Suzanne from Nevada holds up her first Tahsis Salmon caught in Hecate Channel near Tahsis. 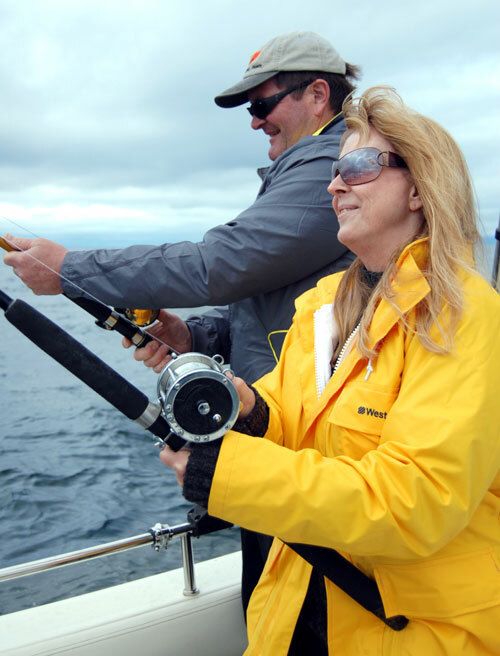 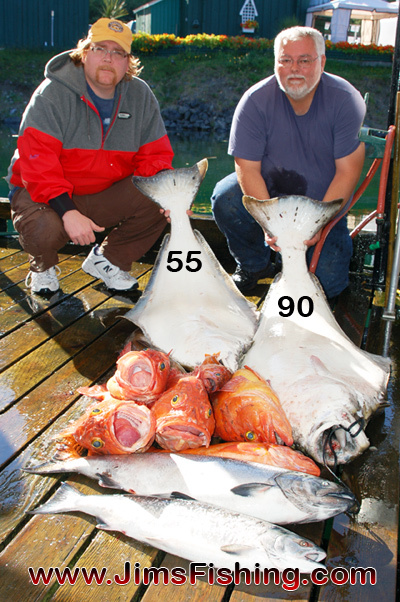 May 11, 2009 - Kevin Gray from San Francisco, California and Suzanne from Nevada, fishing for Halibut 10 miles off-shore from Tatchu Point. 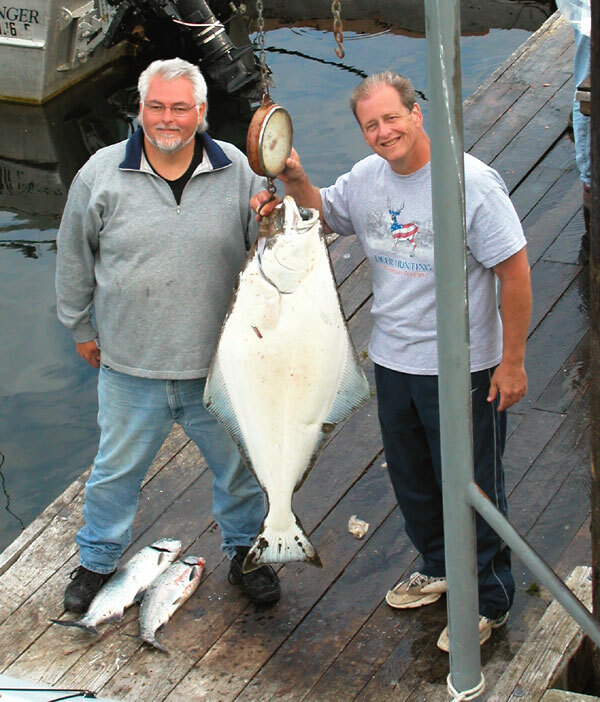 May 11, 2009 - Kevin Gray from San Francisco, California with a nice 35 pound Halibut caught 10 miles off-shore from Tatchu Point. 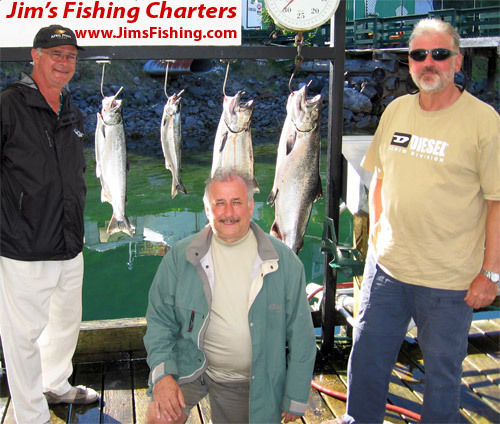 James Rowley of Oregon with Guide Jim Pook and 55 and 90 pound Halibuts, a bunch of Yelloweye and Canary Rockfish, plus one Coho and one Chinook Salmon. 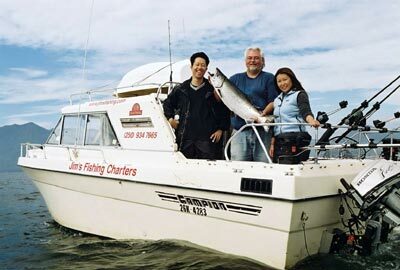 Sunfish with Sushi Hunter in the background. 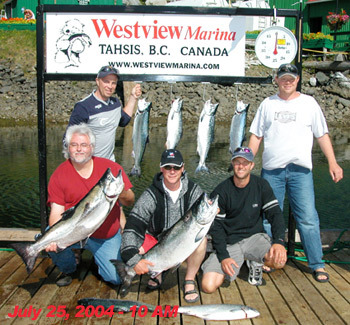 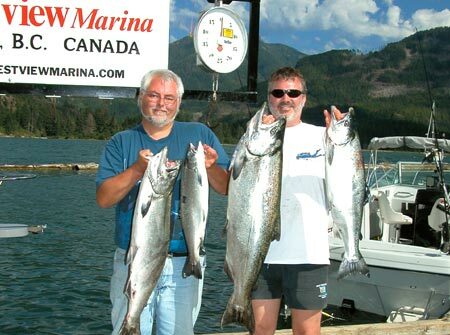 July 15 , 2008 - Robert Minshull from England with friends Chris Hibbert Hyde of North Vancouver, and Larry McDonald of Ladner, BC with a 31.5 pound Tyee, a 28 pound Chinook, a 12 pound Coho, and a small feeder Chinook. 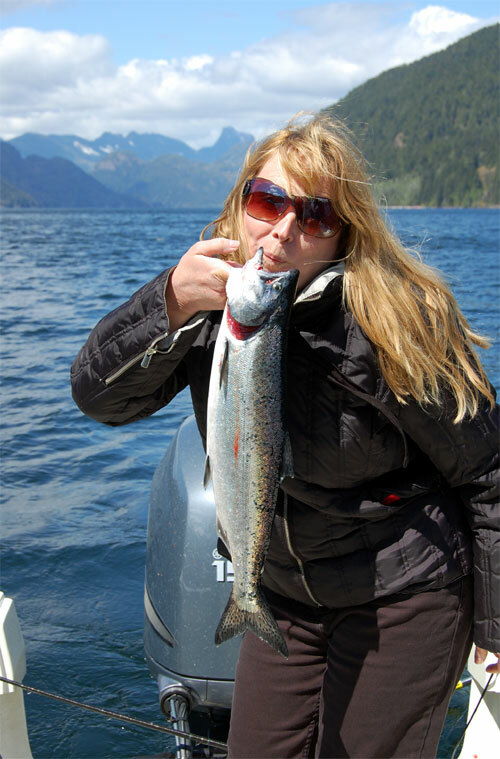 June 13 , 2008 - I finally get to land a fish of my own! 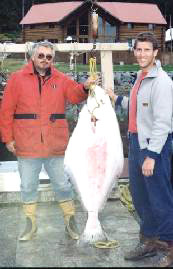 39 pound Halibut, caught right in front of Friendly Cove, Nootka Island, 320' of water. 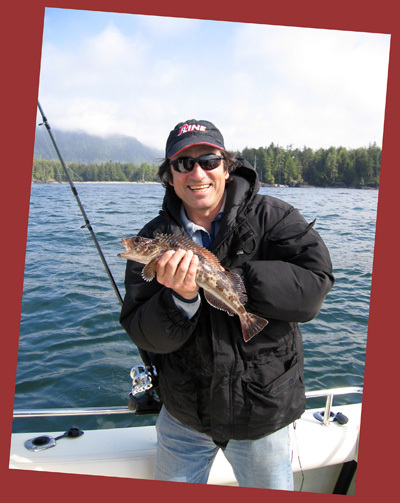 June 11 , 2008 - Jim Hicks of San Francisco shows off a cute little Lingcod prior to releasing it safely back to the water to grow up. 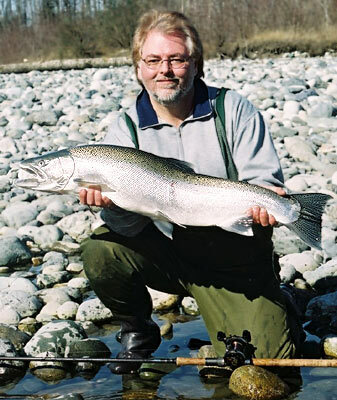 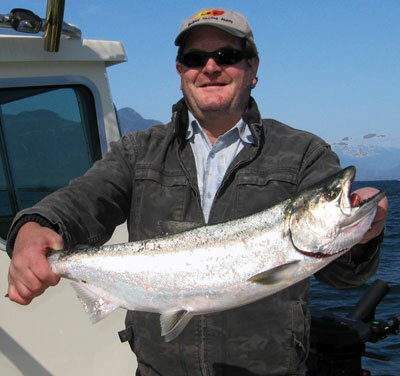 June 11 , 2008 - Kevin Gray of San Francisco with a nice early season white Chinook Salmon caught at Ferrer Point, Nootka Island. 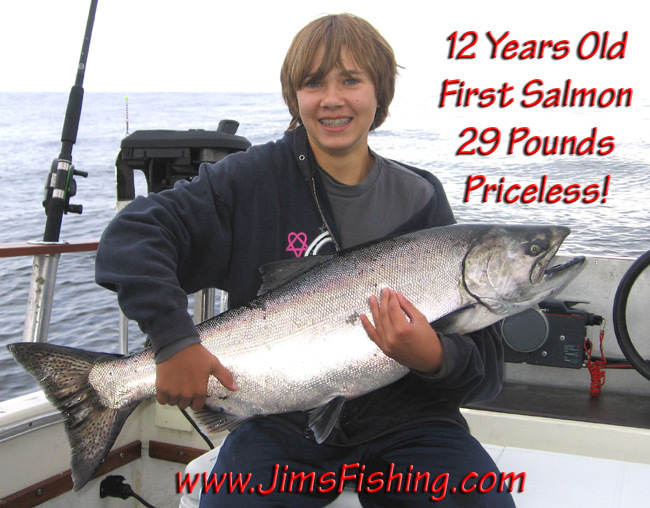 Check out the video at: YouTube. 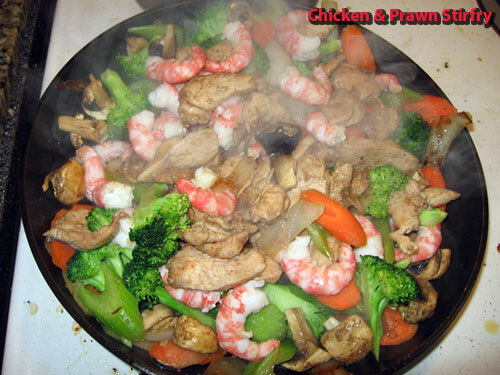 A nice Chicken & Prawn Stirfry. 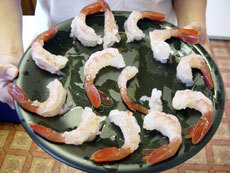 MMMM... Prawns! 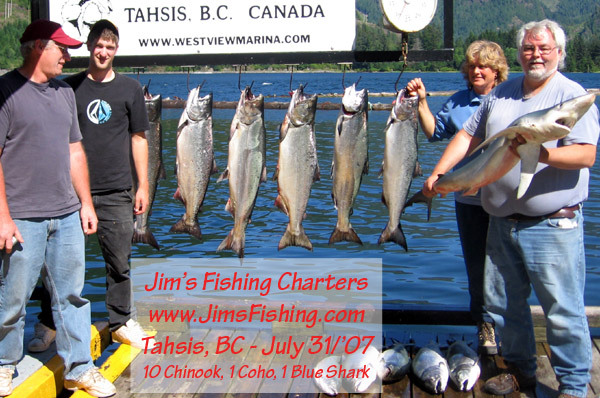 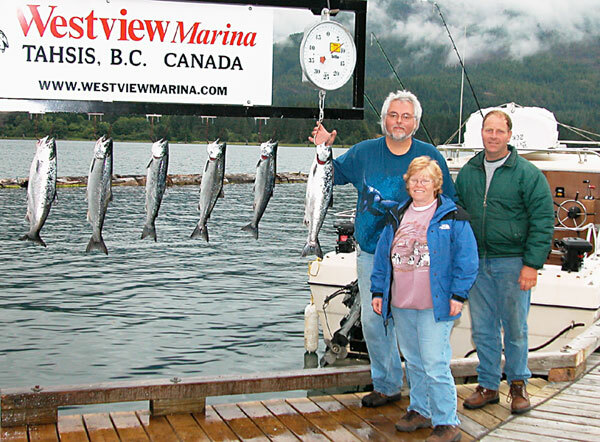 July 31, 2007- The Walsh family from Courtenay & Pemberton, BC with the day's catch - 10 Chinook up to 27 pounds, 5 over 25 pounds, 1 Coho, and a nice 24 pound Blue Shark! 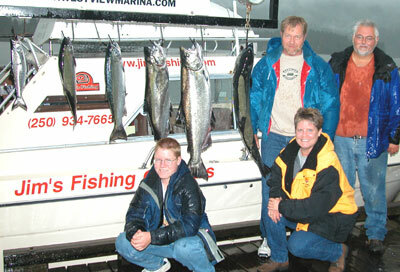 July 19, 2007- The McLean family from England with agreat 28 pound Chinook, 4 Coho, and an 8 pound Chinook. 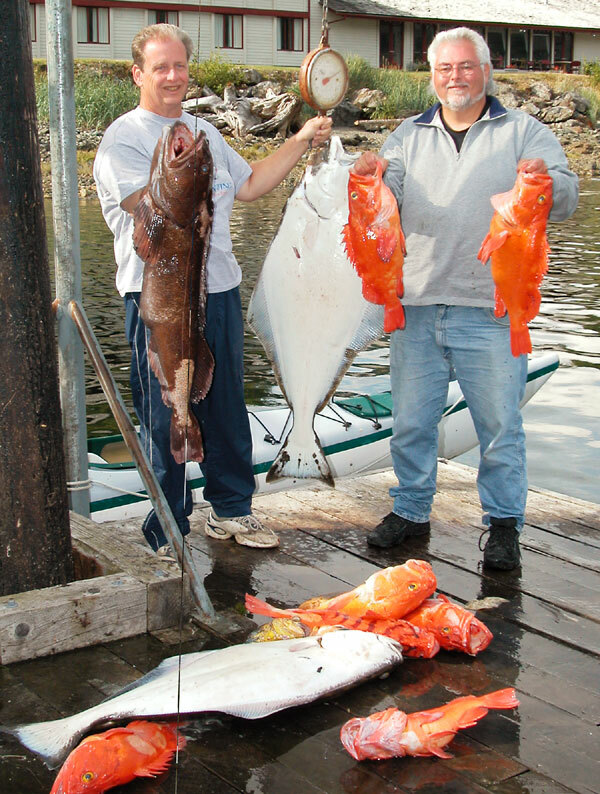 All fish from the Ferrer Point area. 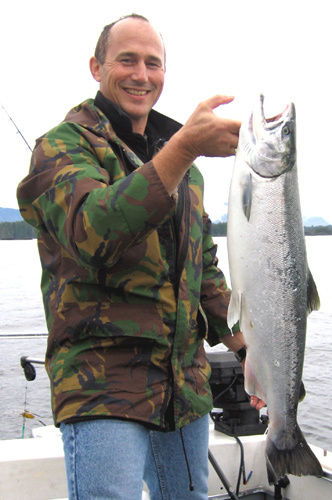 September 11, 2006 - A nice late season Chinook Salmon! 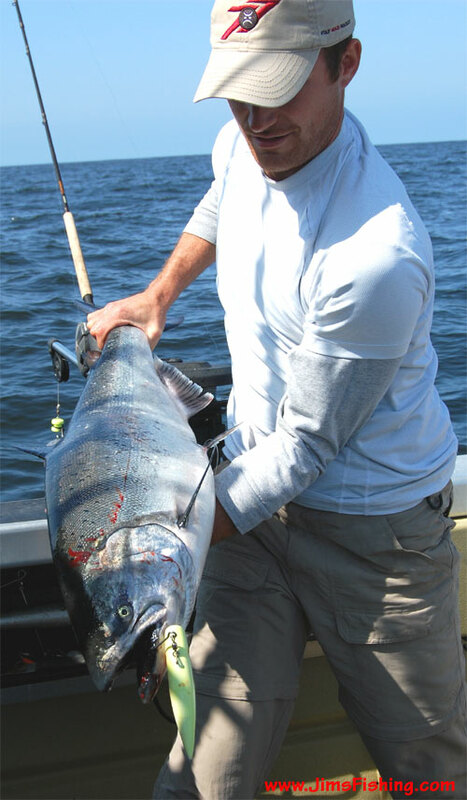 September 11, '06 - A nice big Coho Salmon from the Wild West Coast. 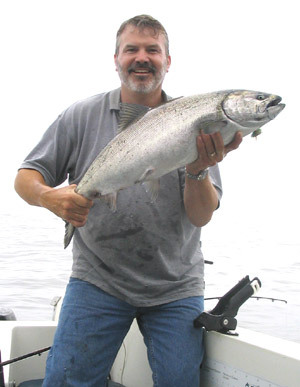 September 11, '06 - A Copper hued Chinook Salmon! 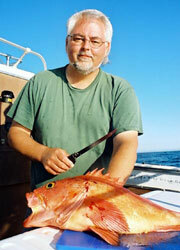 This fish was truly Golden - the only one like it I have seen in many years of fishing. 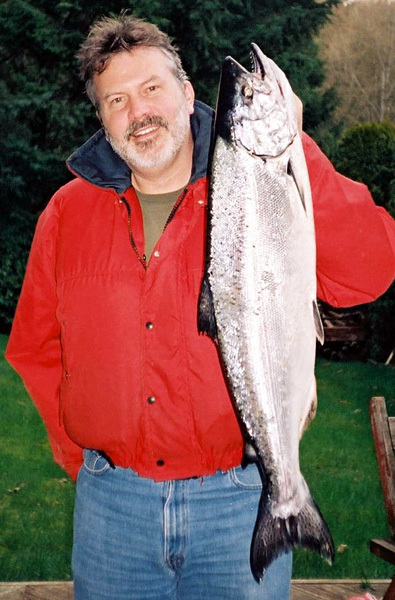 If only the photo showed it's true color. 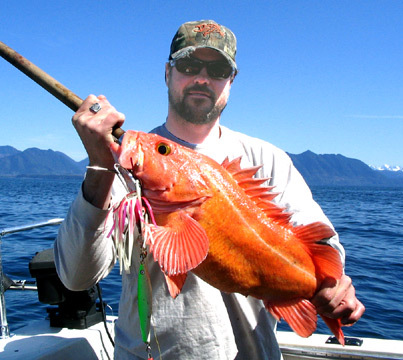 May 2006 - Yelloweye Rockfish caught while targeting Halibut. 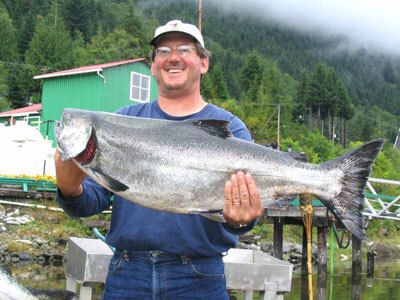 June 24/'05 - Guide Jim Pook holds up an 18 pound Chinook Salmon fresh from the sea! 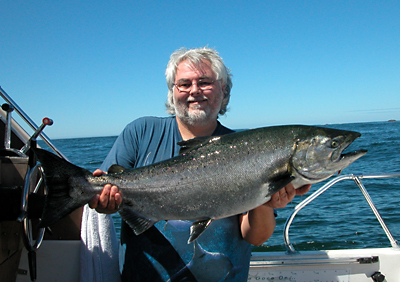 Caught by Elmer Phillipson near Pin Rock in Esperanza Inlet. 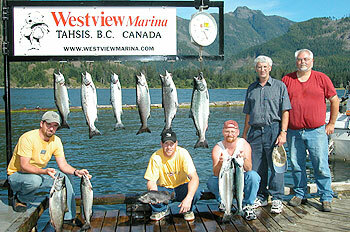 Total catch: 3 Chinook, 6 Coho, 1 Black Rockfish. 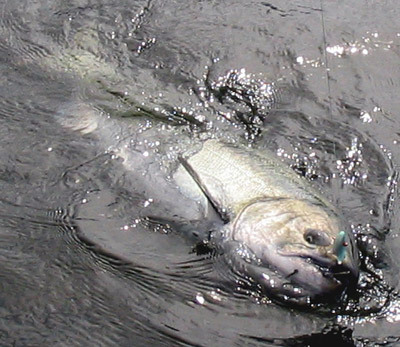 Big Chinook Salmon almost ready for the net! 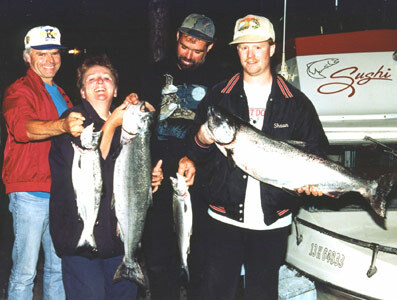 August 24/'04 - Doug Dorius of Utah, with wife Roylene and son Ryan. 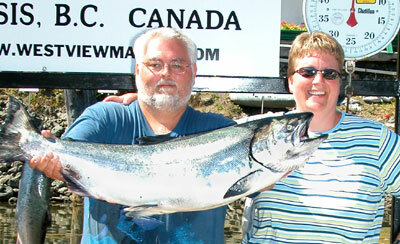 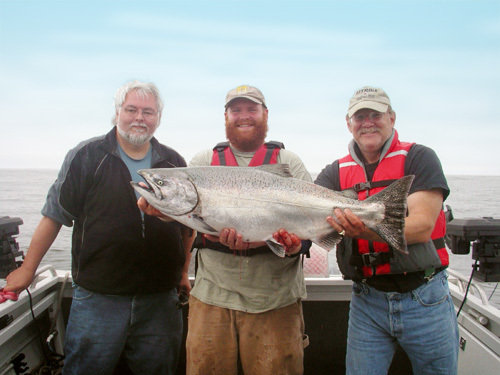 Below: Check out that 32-3/4 pound Tyee that Doug is holding! It was a real pleasure meeting you and Alice. 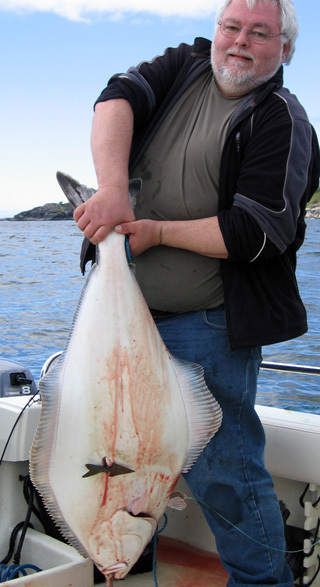 You have a first rate operation there. 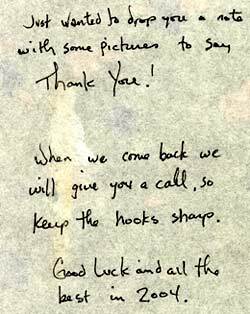 We were especially impressed with the extras thrown in to make the experience even better: sandwiches, soft drinks, fish cleaning (while we relax and have dinner), and the pictures Alice took and put on CD for us. 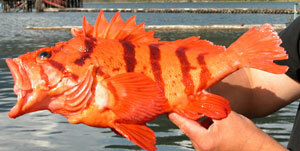 Otherwise I wouldn't have any good pictures of my fish...that Ryan! 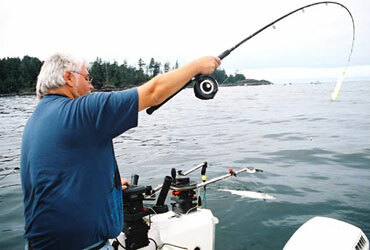 Anyway, thanks again for everything you did to make it our best fishing trip so far. 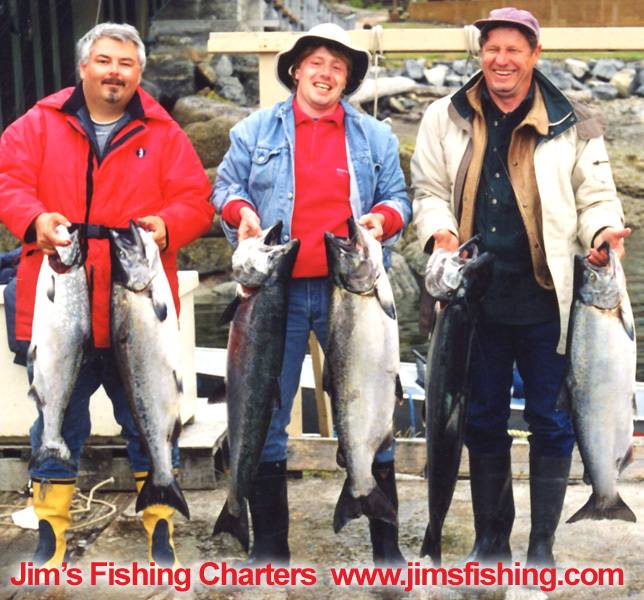 August 23/'04 - Guide Jim Pook with friend and fellow guide from Vancouver with a day's limit of Chinook and Coho Salmon. 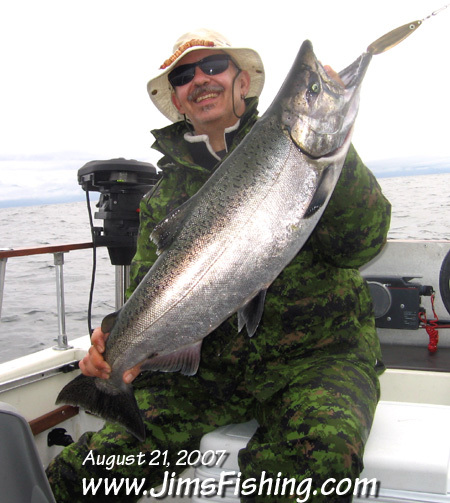 August 23/'04 - Guide Jim Pook holds a 22 - 24 pound Chinook prior to releasing it back to the water. 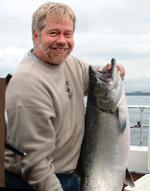 August 23/'04 - Greg Morton holds up a nice 22+ pound Chinook Salmon prior to live release. 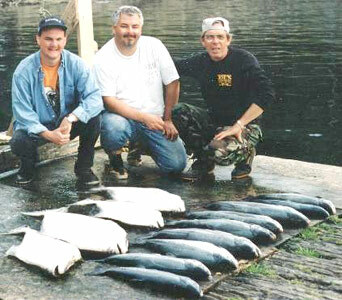 Wow - If this is what they throw back in Tahsis, what are they keeping? August 21/'04 - The Beavers boys from Minden, Nevada with just a few of their fish. 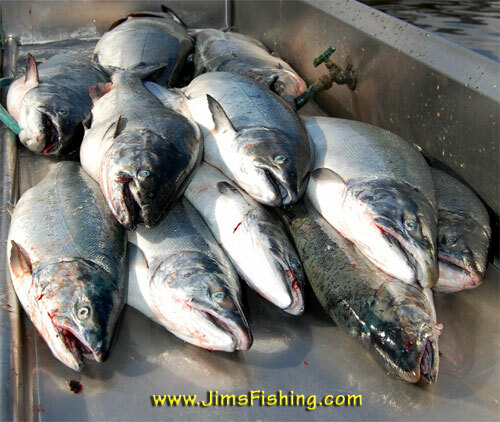 Three days of fishing should keep them in smoked and canned Salmon for years to come! 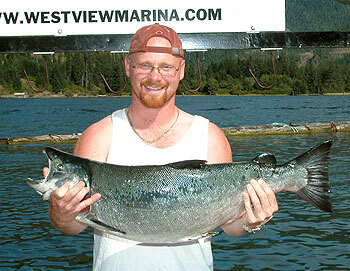 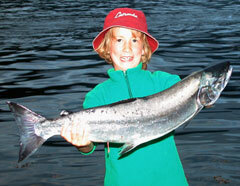 August 20/'04 - Evan Beavers of Minden, Nevada holds up a nice 25 pound Chinook (King) he caught at Ferrer Point. 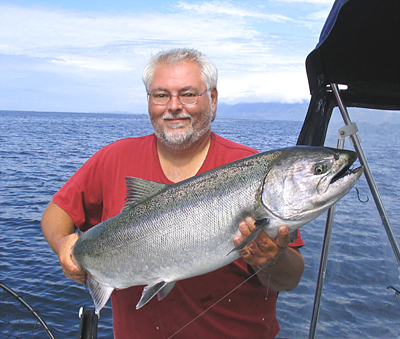 August 19/'04 - Vancouver guide Greg Morton with a 32 pound Tyee Chinook from Tahsis. 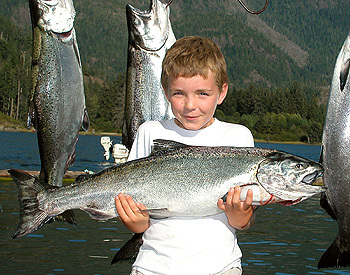 August 19/'04 - Evan Beavers of Minden, Nevada holds up a nice Chinook (King), while his son holds a nice Coho while fishing at Ferrer Point, Nootka Island. 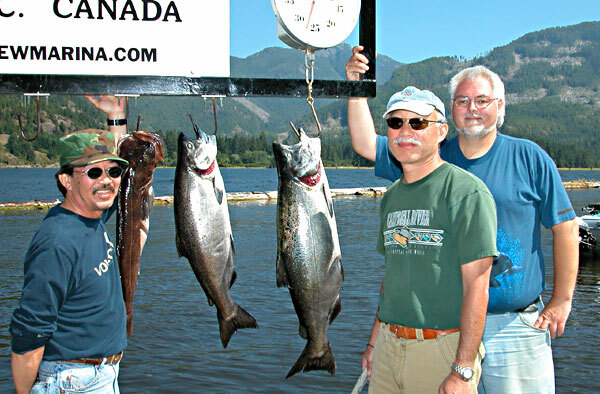 August 16/'04 - Bill Wong, Ken Hall, and Ken Ruiz with a whole boat load of fish. 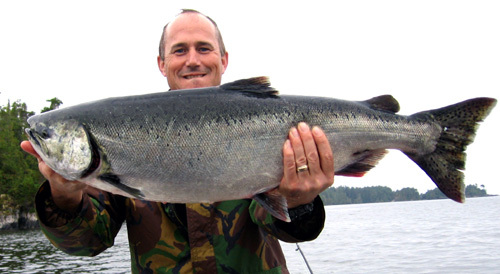 August 13/'04 - Brett Cornelius of Redwater, Alberta holds up a big Chinook Salmon that he caught. 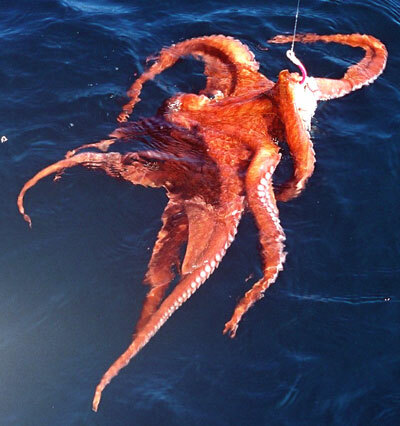 OK - Who ordered the Octopus? 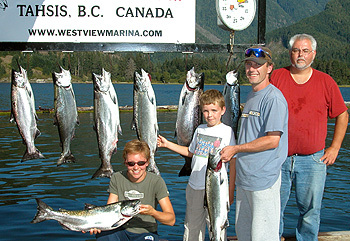 August 13/'04 - Paul & Carmen Cornelius with son Brett, from Redwater, Alberta with a day's catch of Chinook and Coho Salmon. 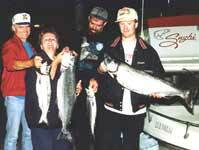 August 10/'04 - John Masich, with son Ken, and grandson Tyler and the day's catch, including two large Chinook Salmon at 28 & 29 pounds. 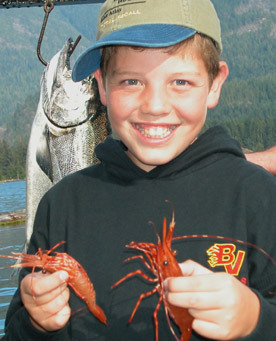 August 10/'04 - Tyler Masich with the a pair of Prawns from the day's catch. 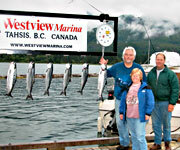 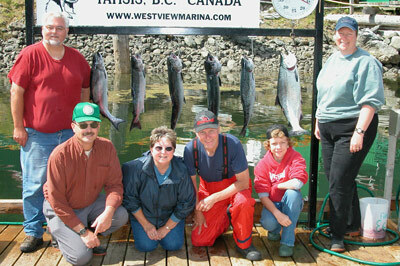 August 8/'04 - Warwick family with the day's catch, including a record 20-3/4 pound Coho (see photo below). 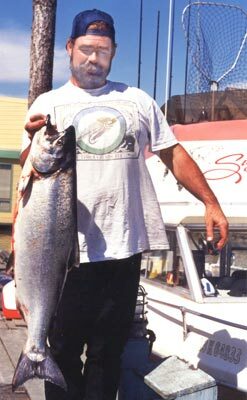 August 8/'04 - Andrew Warwick with this year's record (to date) 20-3/4 lb Coho, caught at Low Rock while out on a charter with his father and 2 brothers. 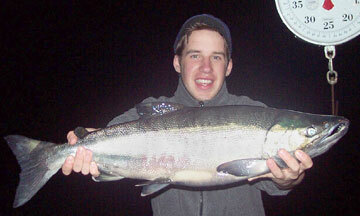 Beat yesterday's record Coho by 4-1/4 pounds! 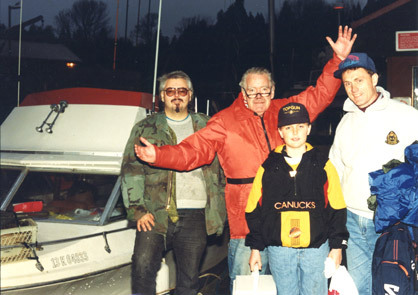 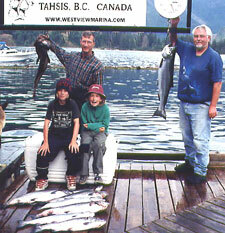 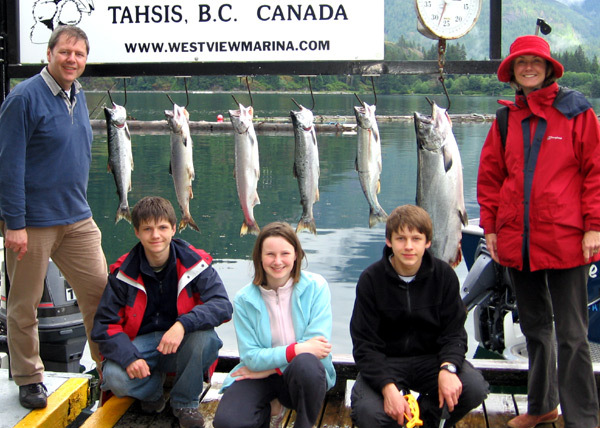 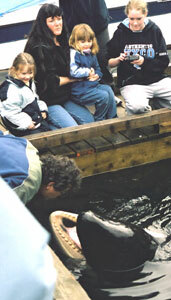 August 7/'04 - Ferguson family from Ontario with the day's catch, including a record 16-1/2 pound Coho (see photo above). 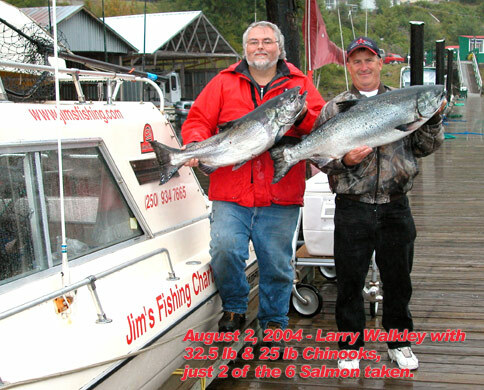 August 2/04 - Larry Walkley holding his 32.5 pound Chinook (King) while I hold a "smaller" 25 pound Chinook. 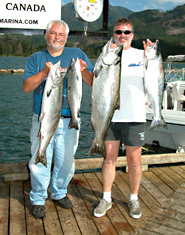 We also kept 2 other Chinook and 2 Coho, and released several big Chinooks. 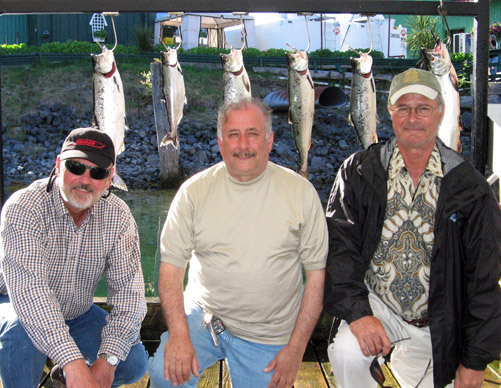 July 31/04 - My good friends Rick Vanderheide (right), Rob O'Sullivan (center) from Vancouver, BC, and Jim hold up half the day's catch - a limit of big Chinook! 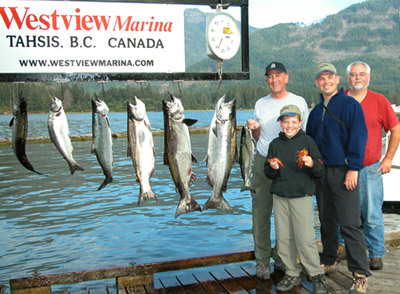 July 25/04 - Sean Barnett and friends from Vancouver, BC. 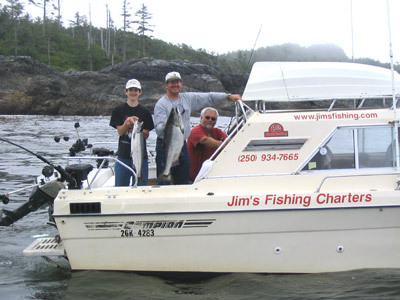 Proving that we catch more fish before 9 AM than others do all day. 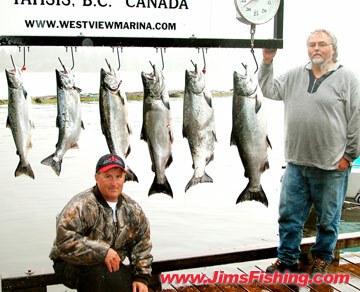 6 Coho and 2 Chinook at 28.5 and 29.5 pounds each. 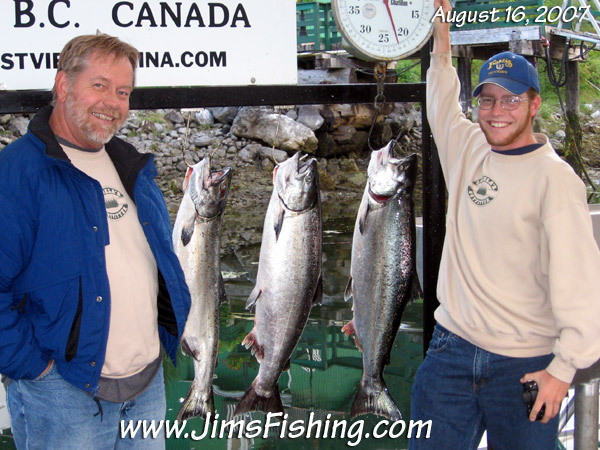 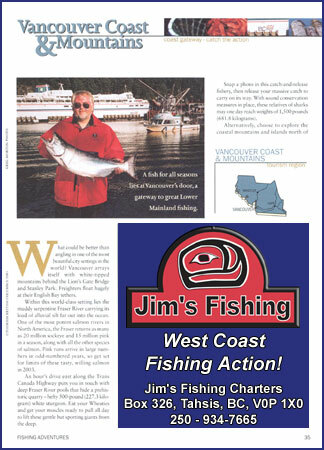 July 21/'04 - Jim celebrates his 47th birthday by going fishing and catching a 22.5 pound chinook on a light mooching rod with only 17 pound test line and a small fly reel. 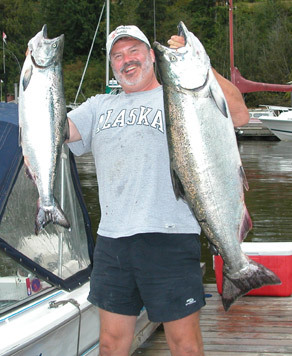 September 17/03 - Norm Gardner holds up a nice late season 23 pound Chinook Salmon from Catala Island. 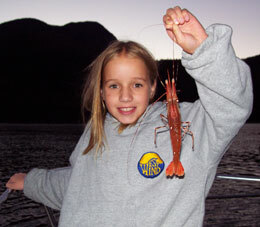 September 27/03 - Rebeca Wade holds up a Spotted Prawn (after a whole lot of coaxing! 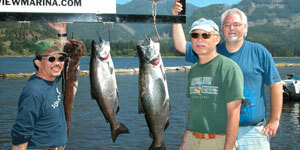 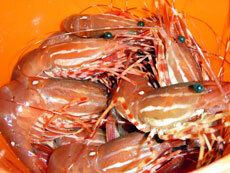 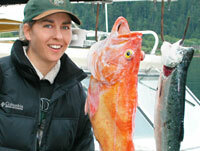 ).Tahsis Inlet has some great prawn and crab fishing. 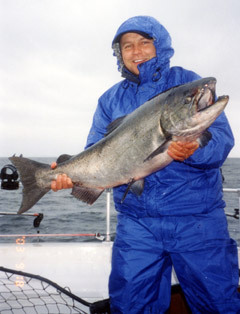 September 28/03 - Toby Wade holds up a nice late season Chum Salmon from Nootka Sound. 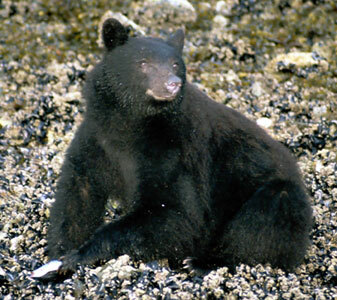 September 28/03 - A mother Black Bear searches the beach in search of food for her and her cub which hid back in the trees as we approached. 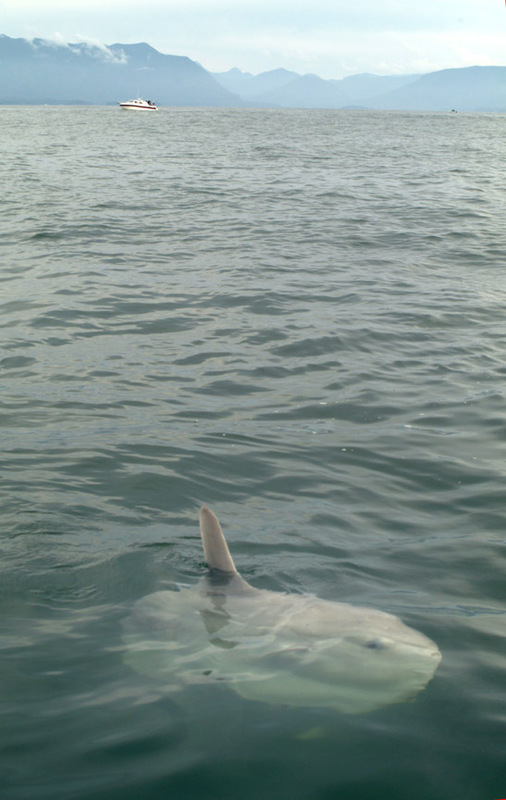 We we able to approach within about 20 feet or so in the boat and she did not seem bothered by the three of us snapping photos for almost 10 minutes. 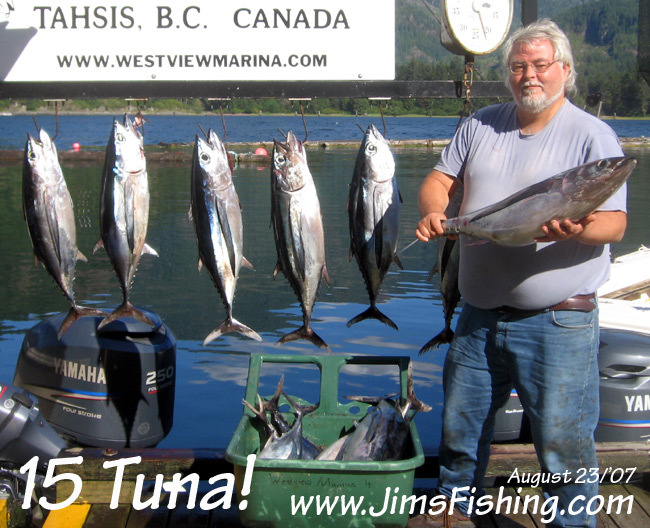 August 16/03 - Jim takes a day off and goes fishing for himself! This was the second day of the derby and Greg Morton and I played catch and release while looking for a winner. 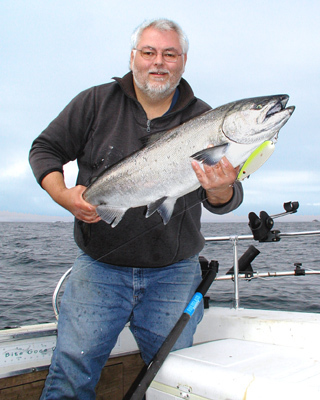 August 20/03 - Jay Heule holds up a nice Coho he caught. 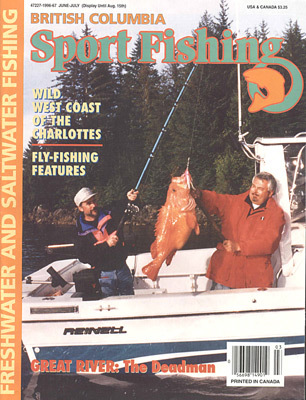 August 20/03 - Rob Heule shows off the 13 pound Lingcod he caught all by himself. 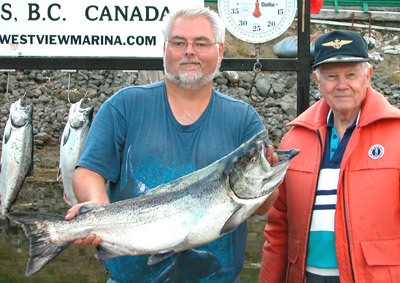 August 20/03 - Rob Heule of Calgary with the 18 pound Chinook Salmon he reeled in off of Ferrer Point. 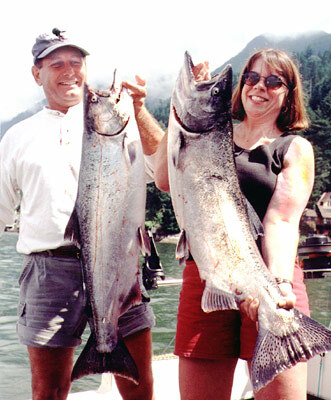 August 20/03 - The Heule family took home 4 Chinook, 4 Coho, a 13 pound Lingcod, and a Black Rockfish. 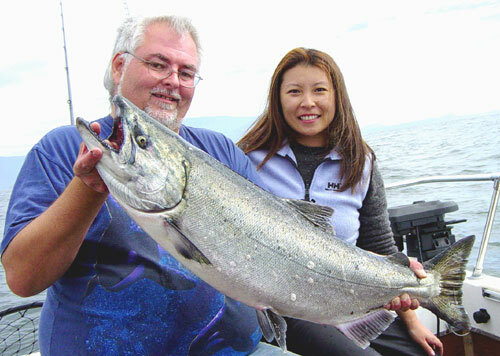 August 13/03 - Jim holds up a 23 pound Chinook Salmon freshly caught by Nancy Sugizaki at Pin Rock on the West Coast of Vancouver Island, BC. 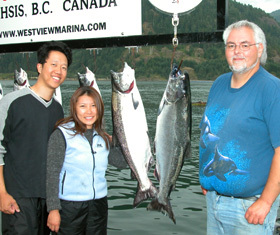 Carlos Lau smiles in approval. 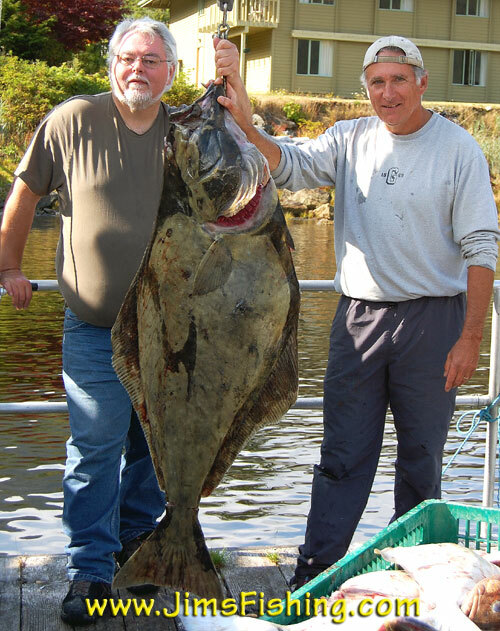 August 8/'03 - Don Neiderhoffer, and his wife Lee, drove all the way from Houston, Texas to catch his 46 and 50 lb halibut, plus a monster 31 lb Lingcod! 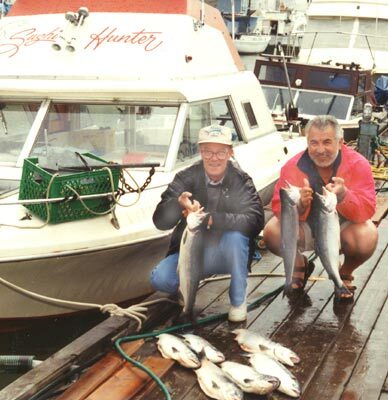 August 15/03- Jim Pook and Greg Morton with Fridays entry in the Westview Marina Derby for 2003. 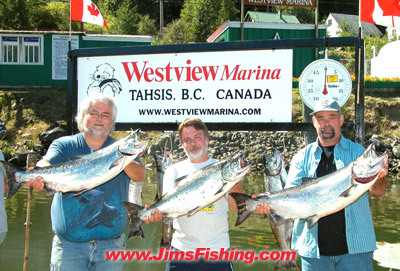 Two Chinook 27lb and 22 lb, 2 Coho 10.5 and 6 lbs. 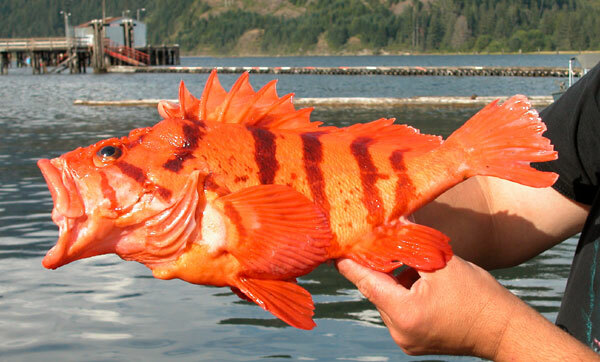 August 8/'03 - A Tiger Rockfish caught while targeting halibut. 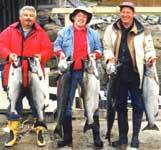 Aug 5/'03 - Ken and Stan Desaki with an 18 and a 28 lb Chinook and a Lingcod. 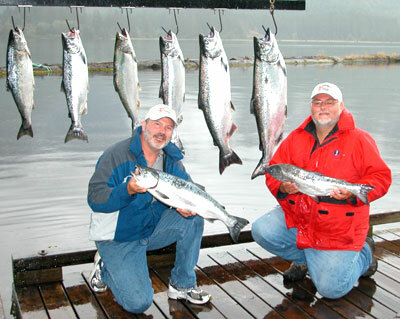 A days limit of Coho and Halibut, and one for the guide! 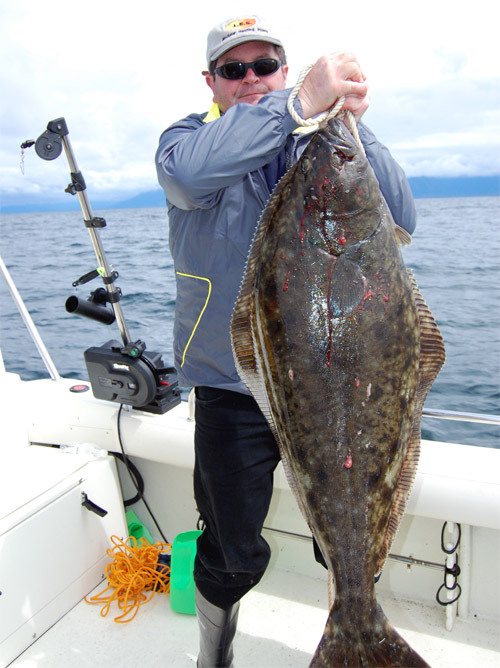 You know it's a good day when even the guide gets his limit! 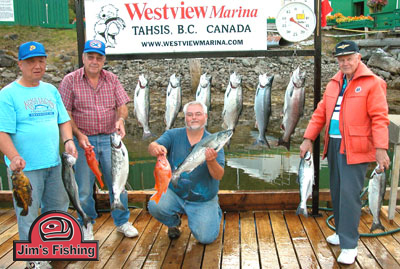 Tahsis Salmon Fishing Adventure, today.